High aperture CaK imaging with full aperture "ER"-like filter? Lunt CaK diagonals have some limit on aperture and focal length they are designed to work. Bigger aperture means more energy and likely destruction of the diagonal. But what if the telescope had a full aperture KG1/3/5 and Wratten #47 filters? They would pass greater amount of CaK light while blocking most of the longer wavelenghts - working as a energy rejection filter. I would be concerned with optical quality (flatness, homogeneity) of these types of filters used as you are stating (over 100 mm diameter - which I believe is the aperture limit recommended by Lunt). 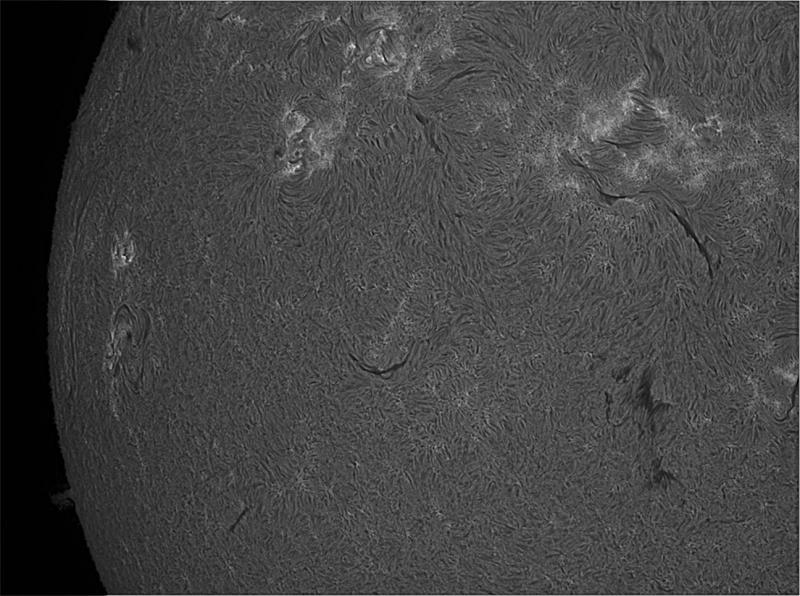 Many have used a Herschel wedge (without the ND3 filter) ahead of the CaK filter as a solution - but this would be better if you are using the straight through version of the CaK filter -- not the diagonal version. I believe this is what the Lunt 152 CaK filter uses. I'm also considering a wedge, as well as adding a sub aperture 50 mm KG3 from Andover (1/4 wave flatness) and a 25 mm Edmund 400 nm short-pass filter (1/4 wave flatness), as the energy passed by the Baader Blue CCD filter used as an UV/IR ERF has a wide ~120nm bandpass up to ~ 510nm transmission with not enough optical density in that blocking range. 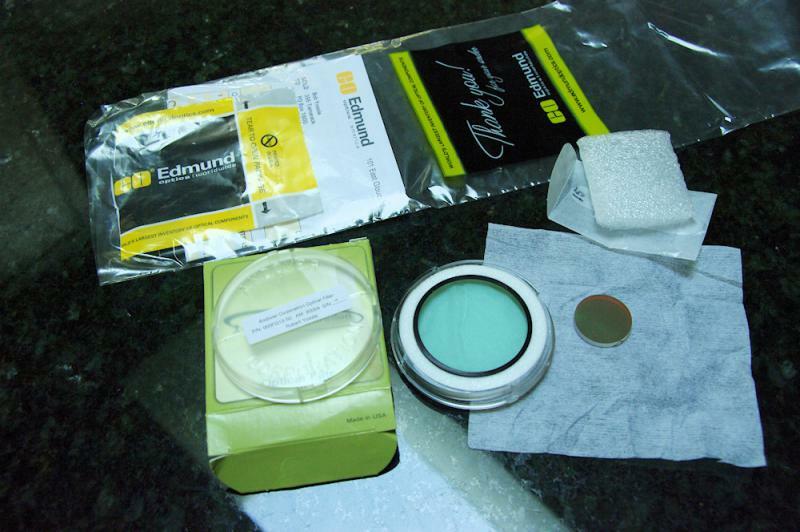 The problem is to find out a good quality full aperture ERF filter suitable for Ca K. I don't think there is anything like this currently avalaible. 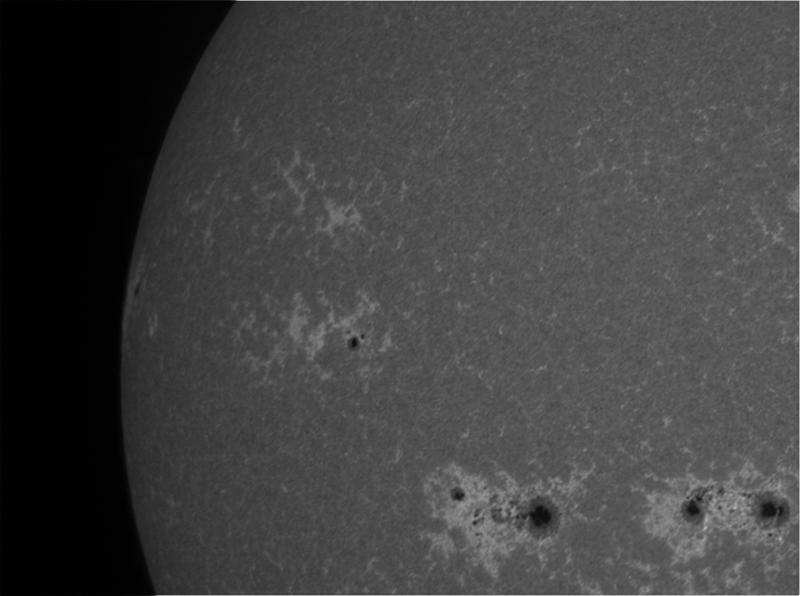 For Ca K imaging with my TOA 150, I either use a diagonal, or place my Ca K filter behind a K line filter. hm... I'll see, maybe I'll have an option to test it. I was thinking about using GSO RC 6". I politely disagree with your recommendation to not go over 150mm for CaK observing. Your own results at 430nm and 12" aperture (!!!!!) tells us wise versa. 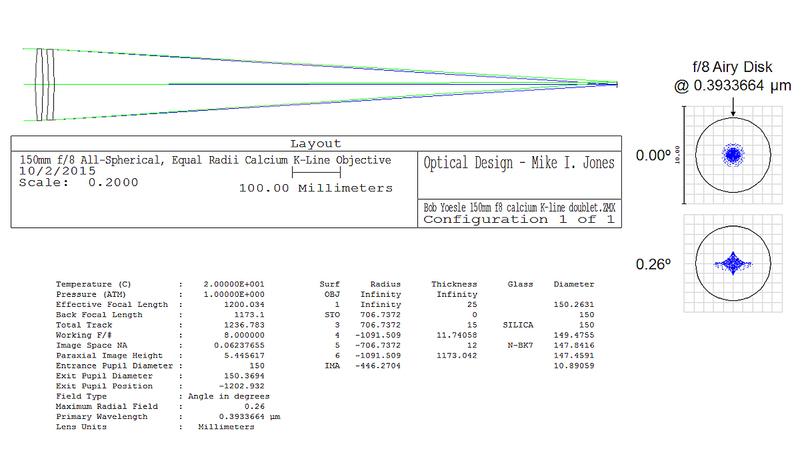 More so, I have tested a 203mm full aperture ERF on a C8 scope with moderate results. The results are not worth to show to public because I were need to use a special corrector for spherical aberration at 393nm wave length. Any SCT has a huge amount of SA at this wave length, but a small corrector can solve this problem completely. More so I have made and now testing a 295mm filters. At 530nm they works perfectly. Hope to test them soon at 656 and 393nm. The question is to nullify a SA at these wave lengths. All will be solved soon. 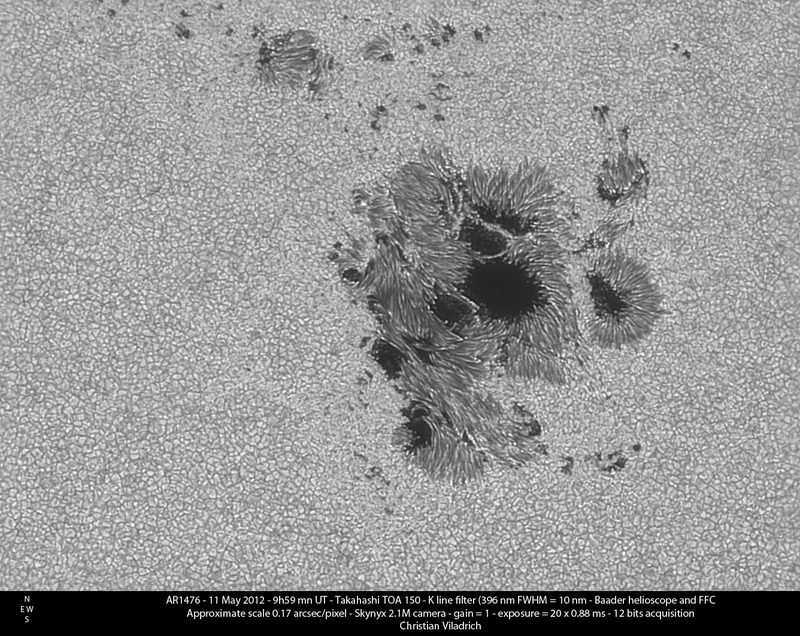 BTW, your 295 mm ERF might be nice for Ha imaging with my 12". Could you give more information ? Resolution is inversely proportional to wavelength, so CaK resolution is 1.67x the resolution of Ha. So a 102mm CaK has same resolution as a 170mm Ha. But as Valery says, optics are typically very bad at CaK. So what we need to increase resolution at Cak is not to increase aperture, but get optimized optics for CaK. And that way we don't have to care about extra heat of additional aperture. CaK blocking filters are made to work with 4", but if we use slow f/ratio, we can use a little more (120mm). I have used 150mm, but that is pushing it. Anyone care to join me getting a CaK optimzed 100-120 achromat? Ordering one is very expensive, but with a few of them we can split design and tooling costs. Edited by pbsastro, 07 October 2015 - 12:56 PM. Then what we need is someone available to manufacture it, and a few people willing to pre-order it (to the manufacturer). A couple possibilities I considered are RF Royce and CFF, but I am not sure of their availability for that work. It would be interesting to know the price for 100, 120 and 150 variants. It may not be much different. I think at 100 mm there's probably a lot out there that already works. A 120 to 150 might be better, and if not too different in cost, doing the 150 and stopping down to 120 as needed for seeing (or filter parameters) could be the way to go. I don't find the CaK scope more prone to bad seeing than H-alpha. But maybe because I didn't used a big aperture... But I did white light with 11 and 14". I also requested such a lens from valery to be produced. It is not cost effective to make one lense. It is better to make 10 or more. Maybe I was no clear to my request. This would be a customized order for you to produce, for 10 or more people that definitely want the lense. Awhile ago we have spoken about the skybender project, i am sure you remember. I would like to have TEN of such lenses produced in any size diameter (preferably 100mm, but any size down to 60mm will work.) I would like to to introduce violet telescopes to support a new emerging technology trend. Let me know if you want to take this serious or not. Edited by icecreamcat, 08 October 2015 - 03:22 PM. Yes Bob, I agree a 150mm f/8 could be more cost effective, and we could stop it down to 120 or 100 as desired. Icecreamcat, your post is a bit confusing. In the end was there any reply from William? 80mm is too small, 100mm is minimum, and preferably larger. 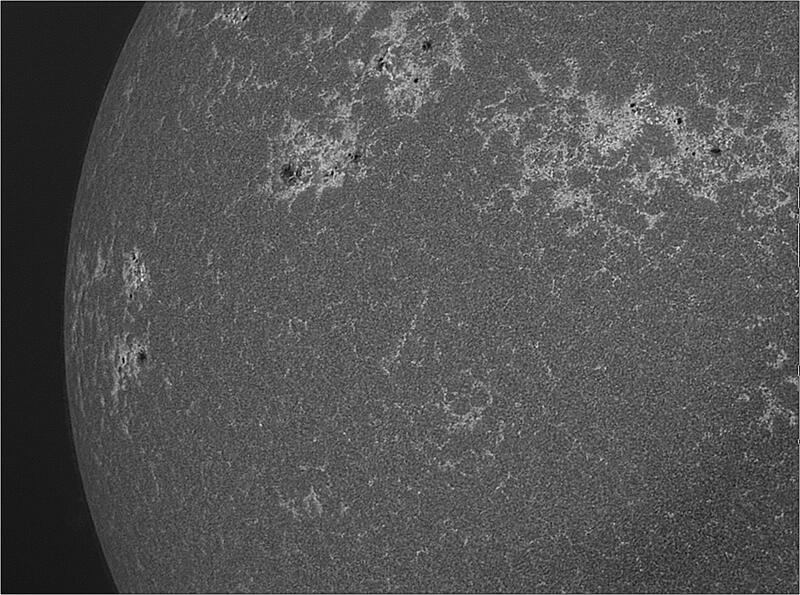 Also for solar, with large apertures, we should use slow f/ratios because of heat concentration on the CaK filter. For night sky doesn't a newton work OK at 393? Edited by pbsastro, 08 October 2015 - 06:13 PM. I will see what can we offer to the market. My preliminary idea has been tested yet with excellent results. A singlet with spherical surface can be corrected for coma or spherical aberration but not both at the same time. Since the Sun is 1/2 a degree in diameter you want a coma free field of view that is at least that large. So if you use a singlet the curves are selected to make it coma free and you aspherize a surface to fully correct for spherical. 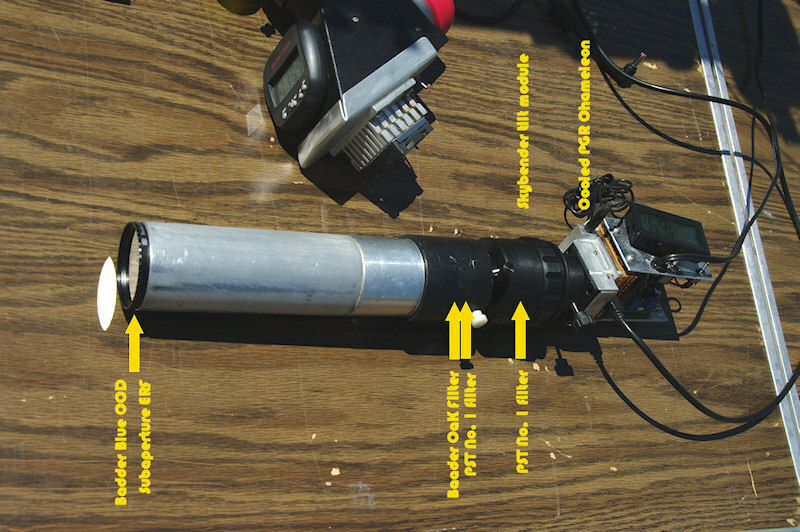 Commercial H-alpha telescope that use singlet oobjective correct for spherical or coma in the telecentric system used for the Etalon. The reason why you use a doublet is that with all spherical surfaces you can correct for both coma and spherical aberration at the same time. From a production stand point it is cheaper to make a doublet with spherical surfaces then a singlet with one aspheric surface. Yes, a doublet is cheaper than an aspheric singlet, but also it is easier to get a perfect spherical doublet than a perfect aspheric singlet, so for the same cost the doublet will likely be better optically. Edited by pbsastro, 09 October 2015 - 11:25 AM. Still regarding aperture limit, it is very dependent on the distance from filter to focus. If we place the filters farther from focus we can use them easily at 150mm. I have a B3400 so I can put it far from focus and still get unvignetted full-disk. My B3400 has a 34mmm front filter, but I note at least the B1800 has the same 34mm front filter. Going larger aperture can help compensate double-stack transmission loss. Bob, how do you find your transmission loss on your Cak double-stack? 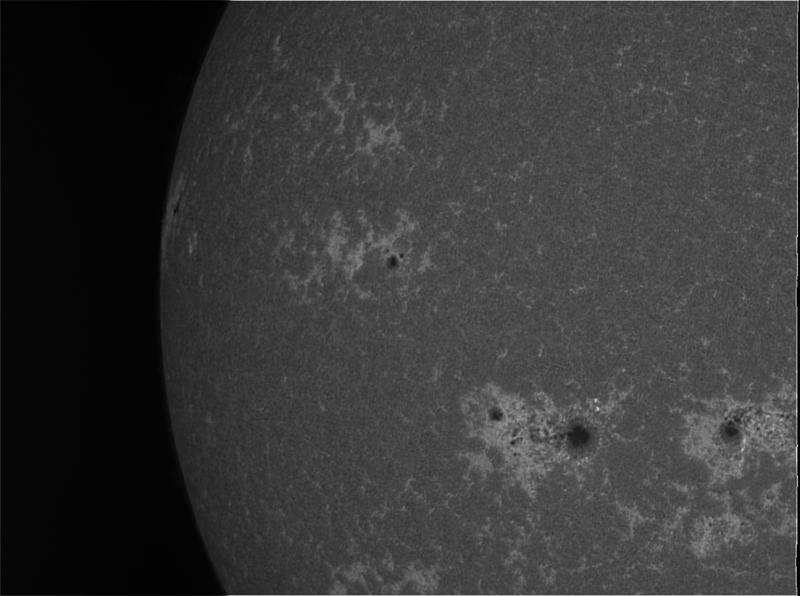 When I took my B3400 apart, it consists of three filters, all similar and same aperture. I guess for double-stacking we only need to use one them, the narrow one. In any case we can try at ease, adding filter components behind a complete CaK filter can not do any harm, it only increases filtering. Edited by pbsastro, 09 October 2015 - 11:38 AM. It can add some reflections. Some more input on the question of seeing versus wavelength. - The seeing degrades as the power 1.2 of the wavelength. It means there is 1.8 more turbulence in Ca K than in Ha. If we use technical terms, the coherence radius (or Fried parameter) decreases by 1.8 when you go from Ha to Ca K.
For example, if a 200 mm is the max diameter allowed by a given level of seeing in Ha (ie. a larger diameter would bring no more detail), then for the same seeing, a 111 mm diameter is the maximum diameter. - In the same way, the max exposure required to freeze turbulence (the technical term is "the coherence time") decreases by 1.8 when we go from Ha to Ca K. If exposures longer than 5 ms no longer freeze turbulence in Ha, then exposures longer 2.7 ms won't freeze turbulence in Ca K.
- in order to be diffraction limited, an optic should be L/4 P-V or L/14 rms wavefront. This means that tolerances on the accuracy of the shape of the optics are more stringent when wavelength decreases : it is more difficult to polish a mirror (or lens) for Ca K than for Ha. - the good thing is that diffraction decreases with wavelength : the resolution of a 100 mm diameter telescope in Ca K is identical to a 180 mm in Ha. In a nutshell, for a given diameter, it is more difficult to get diffraction limited images when wavelength decreases. On a practical side, I've found it more difficult to get high resolution Ca K images with my Taka TOA 150 (which is perfect in UV light) than continuum or G band images with my 300 mm solar Newton. Same as with H alpha, there is a significant increase in exposure time due to DSing in CaK. Identical processing using an ED 100/900, PGR Chameleon. Edited by BYoesle, 11 October 2015 - 11:14 AM. On the other hand, CaK - even double stacked - are far shorter exposures than my H alpha. Identical processing and equipment as above. I am not displeased with my TV102 for Cak also, I found it better than a 150 f/8 achro, stopped down to 102 or not. However image is far from the sharpeness of Ha. If I stooped the Ha from 90 to 60, I would not be displeased also, and I would still be able to get nice pictures, however resolution would be 1.5x lower. CaK was not possible to measure, but it should be below 50%. I know TOA is much better at blue, and so better at CaK, but I bet it is far from perfect at CaK. On a Rohr test I see a 97.7% value at g-line, but that is very far form CaK line. But the CaK value below 50% I find reasonable, but not good. Now, if the TOA value at CaK is really high (above 80%), which I doubt, then a TOA 130 would be a great option as a CaK scope. I guess a TSA 120 would not be so good at CaK. By great option I mean maximum resolution within the limits of not needing full-aperture ERF. Chris, thank you for that important data regarding seeing vs wavelength. As you present a 1.8x value regarding same aperture, that means we have a total 1.7x1.8= 3x resolution drop when we consider CaK should have a 1.7 resolution advantage to start with. 3x is a big drop! 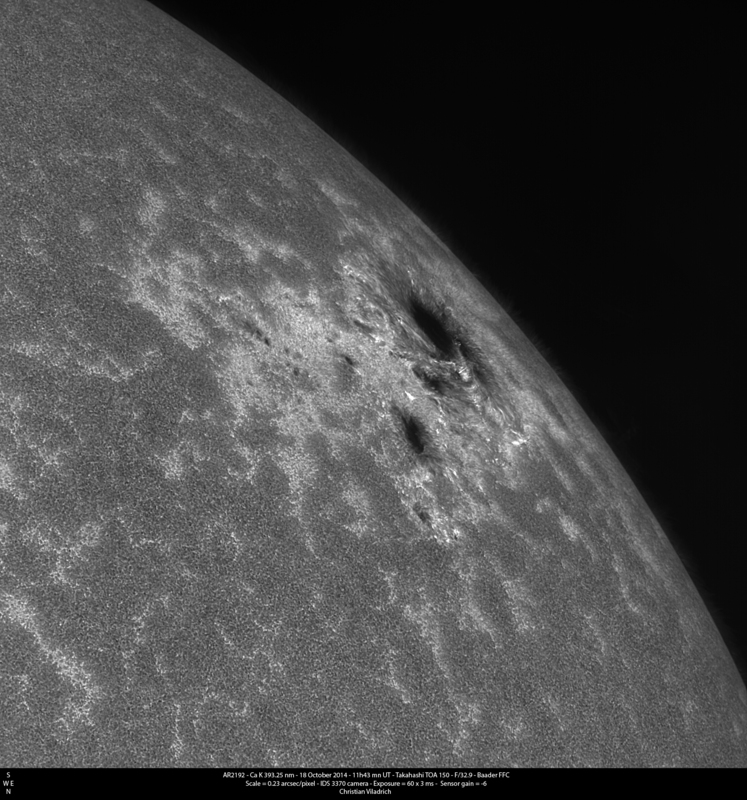 Edited by pbsastro, 12 October 2015 - 10:11 AM. You find CaK brightness higher than Ha, but that is imaging (camera has different wavelength sensitivity than human eye). My main focus is visual, and there CaK is always dim, although I can see it very well. But the important thing to me is that your CaK DS is about 3x less bright than the CaK SS. Does your CaK double stack uses two complete CaK modules? I was thinking about using only the narrow filter on the second module, to keep transmission higher, for visual. But I am afraid that even that way it will be too dim for visual. Valery, I thought as Cak is dim visually the reflections would not be a big problem. At least in Ha I find dim images make reflections almost undetectable. Edited by pbsastro, 12 October 2015 - 10:13 AM. - The spot diagrams at 396 nm I have from Takahashi are excellent. But of course, this is only a proof of the optical design and not of the actual quality.